Scan the products yourself and order even faster! Download the free Order App for your smartphone, now! After you have downloaded the Praxisdienst Order App, open the Praxisdienst shop on your computer and log in to your user account. Open the menu item "Order App"
In your user account, you will find the "Order App" section. Please click on this and you are almost finished! You will now see a QR code on your monitor. Open the Order App on your smartphone and scan the QR code. Finished! 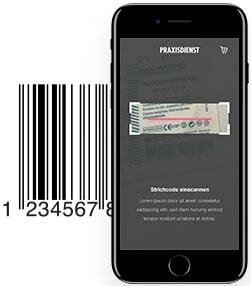 Your smartphone is now coupled with your computer and you can begin scanning barcodes. With the Order App, your smartphone becomes a barcode scanner and your computer becomes the receiver. Instead of manually searching for the required products in the shop, simply go to your storage room and scan the barcodes with your smartphone. 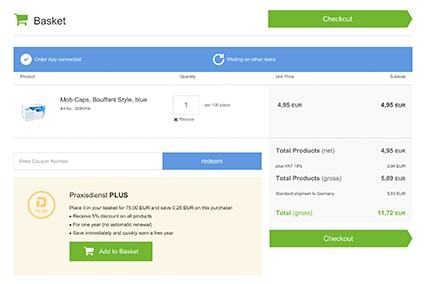 The Order App transmits the scanned products directly to your basket; there is nothing else you need to do. Once you have scanned all of the items, you can complete the order process as usual on your computer. You can make changes to your basket or manually add additional products. When you are finished, simply go to the checkout. Test the New Way of Ordering, Today! The innovative Praxisdienst order app is the ideal tool for all regular shoppers. 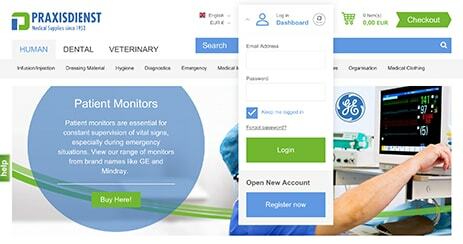 You save time compared to a manual product search, automatically choose the right items and prevent order mistakes. Moreover, it is fun to scan with the app–try it out, yourself!